To Hugh le Despensier, the younger. In answer to his complaint that he is threatened by magical and secret dealings, the pope recommends him to turn to God with his whole heart, and make a good confession and such satisfaction as shall be enjoined. No other remedies are necessary beyond the general indult which the pope grants him. Further investigation reveals a rather interesting little story which not only shows how superstition and religion lived side-by-side, but also that Hugh was obviously enough of a believer in the powers of the dark arts to appeal to the Pope for help. The details behind this case can be found in the Parliamentary Writs, a text that’s hard to find these days outside of the National Archives and British Library (in the UK). Luckily though, I found a transcribed version of the text in an online archive of the Camden Society. As the story goes, some of the leading men of Coventry were at loggerheads with Henry Irreys, the prior of Coventry (1), who had been appointed by Edward II, Hugh Despenser the Elder and his son (yes, you know who I mean). 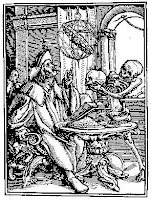 In the winter of 1323, they decided to do something about the irksome man and visited a necromancer within the city – one John de Nottingham and his assistant (and lodger) whose name was Robert le Mareschall. The men of Coventry promised Nottingham £20 and Mareschall £15 if they would kill the prior, the king, the Despensers and others by the use of sorcery. They also provided the materials needed: seven pounds of wax and two ells of canvas so that seven images could be made in the likenesses of the intended victims (those named above plus the priory’s cellarer and steward and also for Richard Sowe, another of the prior’s underlings. Richard Sowe was the test case. On the Monday after St. Nicholas (6th December), Nottingham and Mareschall met in a house just outside of the city and started the process, beginning with secret incantations. This ritual was repeated at intervals until the 4th May when Nottingham gave Mareschall a sharpened feather and told him to stick it into the forehead of the image of Sowe. The next morning, the men visited Sowe and found him raving, shouting out ‘harrow’ but otherwise being completely insensible. A few days later, in another ritual, Nottingham took the feather from the image’s head and plunged it into its heart instead. When they once again visited Sowe the next morning they found he was dead. Nottingham’s powers had been proved and now it was the turn of the main victims to suffer the same fate. At this point, however, Mareschall, for whatever reason, decided to turn informant, and all those accused of murder and attempted murder by necromancy were arrested (2). At the subsequent trial, however, only John de Nottingham was found guilty – and executed. The others were acquitted. 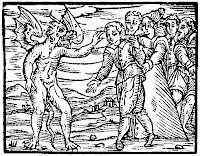 Instead, it seems that the proceedings during the trial brought to light the prior’s ’s alleged misdeeds – those of simony, perjury and sortilege (divination by casting lots). In turn, Henry turned to the Pope to plead his case and, after an investigation by the abbot of Barlinges, it seems that he was found innocent – for he was soon continuing in the duties of his office. Although the events may have occurred as they are told, it is also possible (and far more likely) that it was some kind of frame-up – either by Mareschall or the prior (my favourite suspect). By indicting the men of Coventry with whom he was in dispute, perhaps he hoped to get them out of the way permanently – even if he had to sacrifice one of his own men (Sowe). Mareschall was most likely a hired stooge, or else was swayed by the lure of money. But whatever the truth, this local storm in a teacup had effects that reached to Despenser – and thus to the Pope. Despenser certainly seemed to believe that people were trying to kill him by magic, but what of Edward II? There is no record of him asking the Holy Father for divine help: maybe he was less superstitious – or maybe he already had enough faith that God would protect him. It would be interesting to know, though, whether after receiving the Pope’s reply, Hugh did turn to God with his whole heart – for a while at least. (2) A list of the men’s names is given in the Parliamentary Writs: Richard le Latoner, Geffrei Frebern, Robert le Palmere, Adam de Wolreston, Henri de Hynton, Hugh de Tuwe, Johan de Siflet, William de Gloucestre, Johan de Stonleye, Richard le Taillour hosier, Johan le Wallere que sert Alice la Honte, Henri Pake, Robert de Stoue, Robert de Lichefeld, Robert le Mercer que ad espusee la fille Adam de Lyndeseye, Piers Baroun, Phelipp le Hosier, Wautier Chubboc, Rogier le Brai, Johan Frebern, Reynauld de Alesleye gurdeler, William le Wallere, Richard Grauntpe, Johan le filz Hugh de Merington, apprentiz de court, William Russell, Richard de la Grene, et Johan le Redeclerk, hosier de Coventre. And of course, John de Nottingham! Tagged Coventry, Edward II, Hugh Despenser the elder, Hugh Despenser the younger, sorcery. Bookmark the permalink. Ooo Lady D what a fabulous post. Poor Hugh! I’ve always thought that the Pope could have shown the man some more sympathy here. Great post! I knew that Sowe was (supposedly) found ranting and raving, but not that he was screaming out ‘Harrow’! What a great detail! Fascinating. Thematically, maybe the fear of another using witchcraft against him was an outward manifestation of a conscience. What a fascinating post Lady D. And to think Hugh was spooked by it! Always think of him as fearless. Su – Yes, it is easy to underestimate the effect that religion and magic had on the medieval mind today. Understanding this is the key to understanding the way they thought (to a point, anyway). Susan – Yes, the pope was most unhelpful, wasn’t he? Customer Service was obviously non-existent lol!